A milk phosphoprotein, casein (pronounced KAY-see) is present in the milk from all mammals. It is found in dairy products such as cheese, milk, and yogurt and is also used independently as an emulsifying and binding agent in countless processed foods, including “vegetarian” cheeses, "vegetarian" meats, cereals, breads, and supplements. If you're looking to avoid dairy entirely, you'll need to find products that list casein and steer clear. Recently the Food and Drug Administration made it easier for people to spot casein by requiring food manufacturers to add milk along with casein. This is indicated on the ingredient list and nutrition label in some instances with the phrases "​contains milk ingredients," "made with milk ingredients," or "processed in a facility that also processes milk products." Prior to this mandate, some people with milk or casein allergies were having trouble identifying this milk product which is used in a number of processed goods and desserts, some harder to detect than others. For example, McDonald's fries have casein in its ingredients. Who knew? What Is Casein Milk Protein? Of the proteins found as solids in milk, casein makes up about 80% of those present, while between 20% and 45% of the proteins found in human milk are casein. Whey is another group of proteins found in the liquid part of milk. When eating frozen desserts, stick to sorbets or all-fruit frozen treats. You might also try soy and rice-based frozen desserts and puddings that are clearly labeled dairy-free and/or vegan. When cooking, only use vegetable-derived margarine to spread on toast or while cooking. Remember look at the ingredient list to ensure that the product does not say 'contains milk ingredients' as even some vegetarian foods include casein as a thickening agent, even though milk may not be listed as a separate ingredient. Some batters in fried foods may contain milk products, so avoid these to keep dairy-free. Fried foods may have been used to fry something containing milk and be left in the oil, even though not specifically inside of the food product you're eating. If and when you eat out, be sure to have your waiter ask the chef about the menu items you are eating. It's important to ask if the chef can prepare something dairy-free. In some cases, it can be done, while other times chefs process, cook and prep certain foods on the same equipment as foods that include milk ingredients. Find milk alternatives to use in cooking and everyday life. 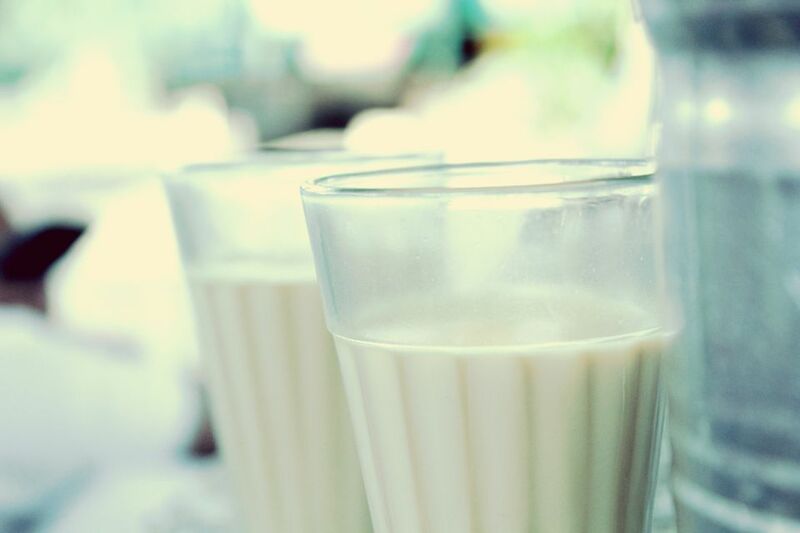 Try almond milk, soy milk, and other milk alternatives as you move toward the dairy-free diet. If you're worried about missing out on calcium from skipping milk and casein in your diet, vegetables can be a great source of calcium. For example, kale, spinach, and other leafy greens are an excellent source of calcium. You might also notice that many products, such as juices, are enriched with calcium for those who may need it.